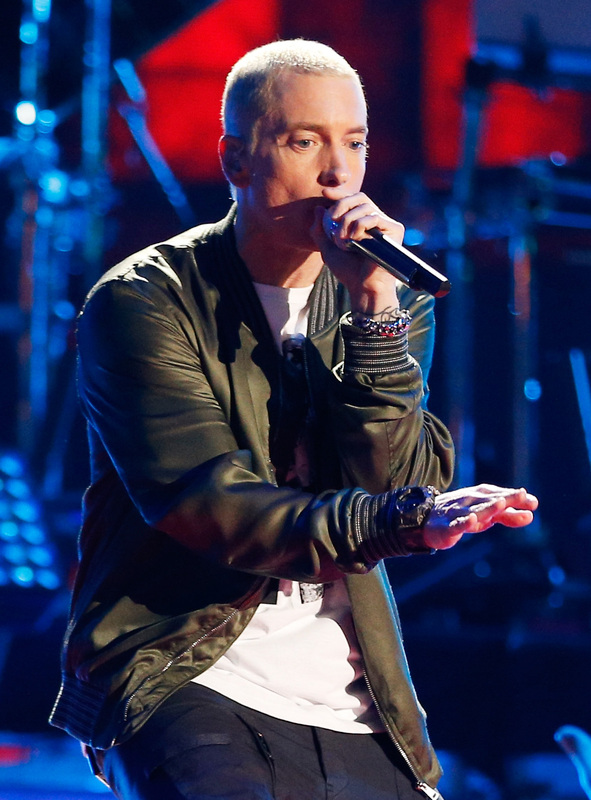 On Sunday evening, Eminem premiered his new single, "Guts Over Fear," with Sia Furler. The song, which will appear on the soundtrack to Denzel Washington's upcoming movie, The Equalizer , isn't very radio-friendly, but I suspect that it's something that Eminem really needed to get off his chest. "Guts Over Fear" gives listeners some interesting insight into the rapper's thoughts about his own career, and ultimately, delivers a really powerful message of perseverance. But I'd rather make "Not Afraid 2" than make another motherfuckin' "We Made You"
However, on the hook, Sia sings about putting "guts over fear" and continuing on no matter what, suggesting that even though Eminem might not feel like comedic songs like "We Made You" were the best use of his talents, he's not going to let that hold him back. He's learned from all of his past experiences and "mistakes," and now, he knows how he wants to move forward. Billboard reports that "Guts Over Fear" will also be featured on Shady XV, "a two-CD compilation featuring an album of Eminem's greatest hits and an album of new material from Eminem, Slaughterhouse, Bad Meets Evil, D-12, and Yelawolf." Shady XV will be released on Black Friday, November 28. "Guts Over Fear" is available on iTunes now.